As announced in the recent newsletter we are very pleased to confirm that we now part of the Vale Lottery. 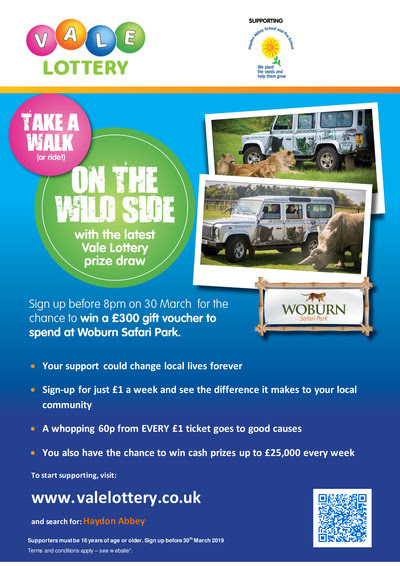 Vale Lottery is a weekly lottery that directly supports good causes which benefit the Aylesbury Vale Community. Lotteries are a fun and effective way for you to help raise much-needed funds in these difficult times of shrinking budgets and ever increasing costs. For every £1 ticket sold the school will receive 50p which will enable us to provide additional resources and equipment. Anyone can support Haydon Abbey School and Pre-School so please encourage as many people; Friends, Grandparents, family, neighbours to purchase a ticket and support our school. Play the lottery and support Haydon Abbey School and Pre-School. Tickets for the lottery cost just £1 per week. Each ticket has a 1 in 50 chance to win a prize each week, with a top prize of £25,000!! That’s a better chance of winning than the National Lottery or the Health Lottery! !